Omelets are a perfect way to start your day. But, you can make them any time of the day…whenever you want a hearty meal. To make this in your truck, you’ll need an inverter with attached surge protector, electric skillet (1500 watts) and cord. Preheat the electric skillet to 325°F. Spray the skillet with non-stick spray. While the skillet heats, crack the eggs into a mixing bowl and add the milk and pepper. Whisk until thoroughly blended. Pour the half of the egg mixture onto the heated skillet. Let the egg mixture set slightly (do not stir). Sprinkle both with the ham and shredded cheese. Carefully loosen set edges of omelet with a spatula, so that any uncooked egg pours to the side of the skillet. Sprinkle half the cheese and half the ham on the omelet and let cook one minute until set. 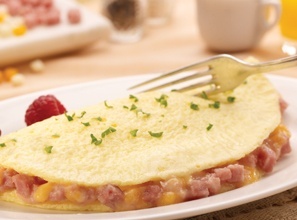 Slide omelet onto plate, folding in half. Repeat with remaining ingredients for the second omelet.